Since 1992, the Ernest Hemingway Foundation and Society has awarded Jim & Nancy Hinkle Travel Grants to defray travel expenses for graduate students attending its biennial international conferences. 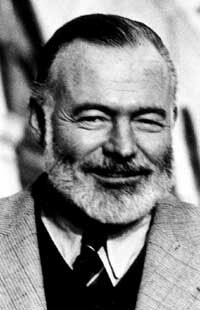 Participants must be members in good standing of the Hemingway Society, must currently be enrolled in a graduate degree program, and must be planning to present a paper at the Hemingway Society conference. Graduate Student abstract proposals are given a blind review by no fewer than three members of the Hinkle Travel Grant Committee and are evaluated on the following criteria: clarity, originality, and value in furthering Hemingway scholarship, criticism, and/or instruction. Although we will consider proposals from previous Hinkle winners, applications from students who have not won before will be given priority. (Faculty with graduate students applying for Hinkle grants are ineligible for service on the selection committee.) See a list of recent winners. The Hinkle Grant deadline is the same as the deadline for the Call for Papers (August 31, 2019 for the 2020 conference in Wyoming-Montana). Graduate Student winners will be notified of their award status by December 2019 for the 2020 conference in Wyoming-Montana. Checks will be distributed to recipients at the conference’s opening ceremonies. Graduate Students are automatically considered for a Hinkle Grant based on their abstract submission and indication of Graduate Student status in their brief bio submitted as required by the Call for Papers, which must be received by August 31, 2019. The Hemingway Foundation and Society established and began awarding the James C. Hinkle Travel Grant in 1992 to honor the memory of Hemingway and Faulkner scholar and beloved San Diego State University professor, Jim Hinkle. An expert on Hemingway’s humor, Jim was legendary for his meticulous attention to the details of Hemingway’s texts and for his ability to recite The Sun Also Rises by heart and without dropping a line. He was the author of Reading Faulkner: The Unvanquished: Glossary and Commentary (UP of Miss.) and many important articles on Hemingway and Faulkner. His essay “What’s Funny in the Sun Also Rises,” is considered a classic in the field. “There was never a man with a longer list of questions. And years of methodical and scrupulous research had provided him with a list of answers nearly as long…. Ever vigilant, Jim felt his most valuable contribution as a critic and a teacher was knowing–as he read–what he didn’t understand. And for him that’s where the fun began. Determined not settle for approximate readings or shrug off troublesome ‘minor’ passages, Jim was nearly messianic in getting everyone involved in constructing meaning–though he never would have framed it that way. Nancy Hanks Hufstader Hinkle, wife of Hemingway and Faulkner scholar James C. Hinkle and longtime member and friend of the Hemingway Society, was every bit the scholar and intellect as her husband, often proofreading his work. Upon the death of her husband, Nancy and her seven children helped to create and fund the James C. Hinkle Award, which has helped dozens of graduate students to attend the Society’s international conferences. To honor Nancy’s memory, in 2005 the Hemingway Society renamed the James C. Hinkle Award to be the Jim and Nancy Hinkle Award. The Hinkle Travel Grants have been generously funded by donations from Jim and Nancy’s colleagues and friends and by a biennial benefit golf tournament sponsored by Jim and Nancy’s seven children: Lon, Ariane, Tobin, Geoffrey, Jennie, Dallas Ann and Barnaby.